Home › Bob Bailey › Animal training, craft or applied science? ‘Let me start by saying that you’re looking at one lucky SOB! Said Bob Bailey in front of a crowd of dog professionals eager to learn from one of the most accomplished animal trainers in the world. A mind always open to learning, a lifetime of experiences, along with a keen understanding and respect for applied behavior analysis have contributed to Bailey’s ability to train any animal to the highest degree. Bailey may be lucky that opportunities presented themselves, but he also knew how to jump on board at the right time and take advantage of each turn, and that’s a skill all in itself. We all learn from those who have paved the way ahead of us. But in animal training, there are very different schools of thoughts that can often seem at odds with one another. Who we chose to learn from will dictate how we work with animals and will unquestionably affect our results. Animal training is nothing new to mankind. People were training animals as far back as 20,000 years ago, during the stone and bronze age. Humans have been training dogs to assist them in hunting, to protect them or to fight during wars. 4,000 years ago, dogs were already working in scent detection tasks. Greeks and Romans were training dogs for sports and entertainment, and were already writing manuals about animal training. The training at the time was based on coercion and many trainers were very effective at it. Today, we can divide modern animal training into two schools of thought: training is either considered a craft or an applied science. 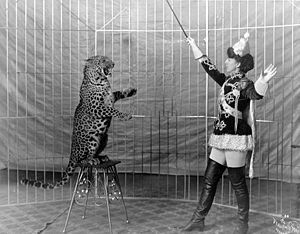 Training as a craft: Over the course of human history, animal training has mostly been considered a craft or a trade, passed on from generation to generation. Like other crafts, such as pottery or woodworking, the knowledge is based on experience and trial and error. There can be distortion over time but overall the craft is generally very resistant to change. Tradesmen of all sorts carry secrets, myths and mysteries, but also errors and misconceptions. As an apprentice, you don’t question the master and tend to preserve the knowledge. Many trainers today still apply the techniques derived by several thousands of years of tradition. data and measure change. Science tries to minimize and get rid of error. ‘The old stuff gets kicked out’ and new information replaces it. The application of science is technology and training as technology evolves and improves quickly. A science-based trainer will measure observable behavior in order to draw laws and define predictable relationships between the changes in the environment and the animal’s behavior. Most of all, a science based trainer will apply those principles to modify behavior. Science in the late 1800s and early 1900s developed measurable means by which we could influence an animal’s behavior. From the work of Pavlov, Thorndike, and later Watson and Skinner, who brought to light the laws of classical and operant conditioning, we now had an objective and validated method to train animals. But getting a rat to press a lever in a box and training a dolphin to swim several miles towards a precise goal in the open ocean are quite different. In 1943, Marian and Keller Breland, both students of Skinner, were the very first to take the science out of the laboratory and into the real world. Using clickers made for the military, the Brelands developed a brand new training technique: Clicker Training! Together, they founded a company called Animal Behavior Enterprises (ABE) that focused on training animals for advertising needs. Their goal was to train precise behaviors as quickly and efficiently as possible and created the field of applied animal psychology. ‘Quality behaviors at the lowest cost’ was their motto and with the application of what they had learned from years spent in the laboratory, they quickly became very good at it. Just like any new idea, this new training method was met with much resistance from the other trainers. When the Brelands wrote the very first clicker training manual in 1955 and attempted to sell the idea of clicker training for dogs, they were rejected. They weren’t able to publish and were subject to criticism in both the training community for using food and from the academic community because their data was mostly gathered in the barn they were working in, not in laboratories. Dog trainers rejected operant conditioning as being ‘too soft’ and referred to the Brelands as ‘pointy-headed intellectuals’. Bailey met the Brelands when he was hired as the director of training at the US Navy in 1962, after completing a BA in Zoology at the UCLA, and quickly realized that they were quite ahead of their time, combining both applied behavior analysis and evolutionary biology and ethology. Inspired by their work, he left the navy shortly after and joined ABE. ‘The Brelands were light years ahead of any other animals training organization in the world’. The number of behaviors their trainers were able to change during any given day was simply impressive and the way they were able to get those results was through the direct application of science. Since that time, Bailey has successfully trained thousands of animals of all kinds and for all sorts of tasks, from very simple to extreme. Much of today’s dog training has been inspired by his work. Along with others, like the Brelands of course, but also by Karen Pryor, they have all contributed to bringing applied science to the world of animal training in general and to dog training in particular despite resistance and criticism from their piers. Choosing to become a ‘science-based trainer’ is certainly not an easy choice. Most trainers are not scientists yet how good we become depends on how well we understand and apply our technology. If there is anything to learn from this inspiring animal trainer, is that we can always get better at what we do as long as we’re willing to challenge the old and always stay humble, open minded and willing to learn. I do not like the definition of ‘craft’ that you use here. Craft as an art or a skilled trade is exactly what those of us actually involved in training are doing. Science is a body of “knowledge ascertained by observation and experiment and critically tested” and a such we rely on it to improve our training method, just as those in other crafts rely in science. Those who rely on the old out-moded dogma of the trade, are using less efficient methods and as such hardly deserve the title of ‘craftsman”. 3 Pings/Trackbacks for "Animal training, craft or applied science?"